This weekend i went to Northern Arizona and helped survey the main passage of a cave, build a cave gate, and an outhouse. Here are some pictures from the cave-a-thon. Released from the "Tombs" after police arrested me (Joshua Kinberg of Bikes Against Bush) I'm now sitting in the MSNBC trailer at Herald Sq., NYC, with Ron Reagan and Joe Trippi after spending 24 hours in the "Tombs" with several hundred Critical Mass cyclists, who were arrested the night before. 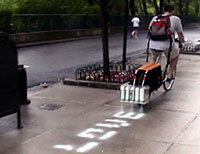 Joshua Kinberg: I was arrested while Ron was interviewing me about my invention-- a bicycle that prints text messages on the street in water-soluble chalk. While we were conducting the interview, the police stopped me and asked for my ID. After I produced identification, the police waited for their sergeant to arrive before placing me under arrest without stating the charge. I was doing nothing more than describing my invention to the media and explaining my disagreements with the Bush administration. When I arrived in the Tombs, I was placed in a cell with around 30 other cyclists. They had spent the previous night in a location they were affectionately calling "Lil' Gitmo," a makeshift detention center on the West Side piers converted from a former bus depot. Lil' Gitmo had cells sectioned off with chain link fence and razor wire, and a floor covered in motor oil, transmission fluid, and other toxic chemicals. The cyclists detained there were forced to sleep on this hazardous floor wearing nothing more than bicycling shorts and t-shirts. Consequently, several developed serious skin rashes the following day. After 36 hours most of the cyclists had been released with a pending court date. Several had been arrested when specifically following police directions to exit the peaceful bike ride. Others had not been part of Critical Mass, but had simply been on the streets with a bicycle at the wrong time. I was released after 24 hours in detention with a court date set for Friday. Unfortunately, all my equipment-- bicycle, laptop, cell phone, and custom designed electronics-- has been confiscated. Thus, the Bikes Against Bush performance, where I would accept and print messages sent from web users, is likely to be cancelled. A volunteer lawyer from the National Lawyers Guild is confident that my case will be dismissed on grounds of the First Amendment, but we will have to wait until Friday to see. A video of the arrest recorded and edited by Yury Gitman has been posted online (BitTorrent), and the story of my arrest has already been blogged on SlashDot, BoingBoing, Kottke, and JuliaSet.